Viewing a thread - Usher saddles???? 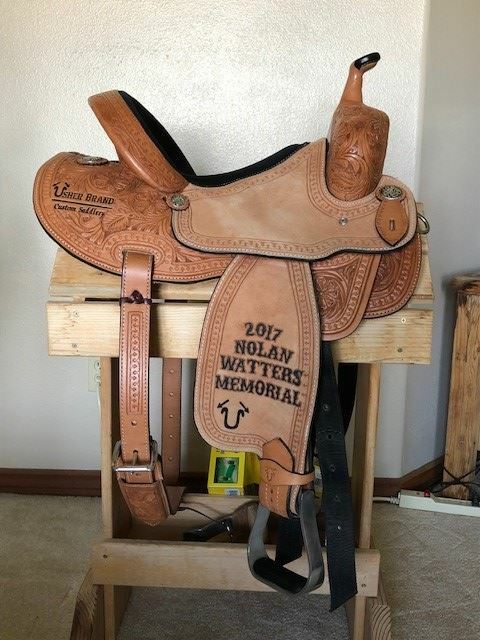 I’m thinking about ordering a usher saddle. I was wondering if anybody uses them? Do they fit your horse(s) good? what you think about them overall? Location: Missouri Bump for you. I'm curious to know as well. I LOVE my usher saddle. The best is that pencil roll seat. It fits my horses well & fits me great also. Quality saddle & they are wonderful people to work with. I switched to them a year and a half ago and cannot say enough good. This is the only saddle i've found that allows me to naturally roll my hips back in a turn. Plus, Joan and her crew are unreal to deal with. They go above and beyond. Most horses fit a medium tree. I have a medium and a wide and have yet to find a horse that I've struggled to fit "good enough". The unbranded line is an excellent option as well. My medium tree is usher brand and for my wide I decided to go with an unbranded. There is a definite difference in quality BUT I do not find it to be lesser quality than most other top brands. The biggest difference I noticed in my unbranded took a few rides to break in, where my usherbrand was 'broke in' from day one it felt like. I do recommend going with a pencil roll cantle as they ride a bit deeper than the cheyenne roll. I won one at a race October 2017. Paid for some custom upgrades. Skirt came incorrectly and I had to pay shipping send it back for it to be corrected. I ordered a wide fit, fit my horse beautifully, unforunately it put my feet behind me consistantly. I tried to adjust the rigging that they add that is meant to keep your stirrups from getting behind you as well as different stirrups. I wanted it to work, it was SO comfy. But I ended up having to part with it and had quite a hard time selling it. I read about them last week before going to Belton jackpot. I sat in some models set up and loved the feel. I normally ride in a 14" but due to the amount of rise in their seats, was told to ride a 14 1/2". I was skeptical but I had the same thigh room as normal. I have been through four other saddles with my Dash Ta Fame horse and fought with balanced ride and him tossing me forward in turns. I am 53 and my core strength isn't what it used to be. Clell went through all the features of the design. I thought I needed forward hung stirrups to stay forward. The Usher Brand has a strap underneath that keeps stirrups from going behind you but keeps my feet up underneath me for a balanced ride. Because you ride 1/2" bigger seat, the saddle horn is much easier to get behind and brace in the turns. Clell was formerly an equine chiropractic and his wife was a Canadian champion barrel racer. They combined their knowledge to create a saddle comfortable and balanced for rider as well as horse. 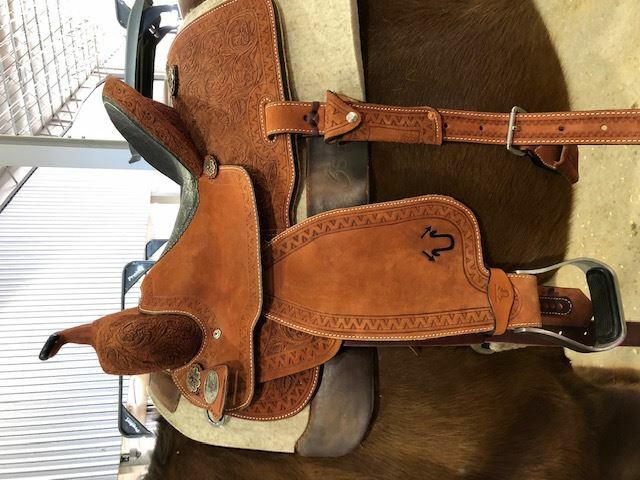 The branded saddles have higher quality leather, real wool lining and other upgraded features such as decorative conchos, tooling, buckstitching etc. The unbranded have the exact same tree. I demoed an unbranded. It rode the same. The pencilroll was a problem for me. It dug into the back of my thighs at a lope. Clell said that happens with some girls. Thankfully, he had one available that was in my size without pencil roll. I made an exhibition on my horse in it and he worked awesome. I tried out a horse in competition in it and I think I would have had a hard time staying with that horse without the saddle. It was such a game changer for me, I decided to keep my horse and not buy the horse I tried. Not only is it comfortable and secure to ride even brand new but it allowed me to get over my horse when needed, to easily with little movement sit on my back pockets and use my horn effectively. The unbranded are in the $2,000 range. The branded can run between 3-5,000 depending on the upgrades they come with. The rise in the seat keep me from sliding to the front of my saddle and kept the pelvic area at an angle that prevented me from getting too far forward. I also like that despite the rise in the seat, I could lean forward and not catch my shirt on the horn. I felt like I could concentrate on my horse so much more without fighting to get my body in the proper position or to regain my balance at any point in a run. Everybodys body is built different and riding styles can vary as well but I would encourage anybody that has the opportunity to test ride his saddle. My horse is pretty thick in the lower back and it fit him fine. The horse I tried out was a little on the thin side and much smaller framed and it fit him well too. He was also built a little down hill. I took the stirrups up one hole and with the rise in the seat, never felt like I would slide forward or fight to stay on my back pockets in the turn. Stirrup holes are much closer together so you can get a more custom adjustment. I have almost raced to the barn after work every day because I love riding in it that much! Other saddles I have tried on this horse are Martin BTR, Robbie Phillips, Martha Josey flex tree, Martin Stingray and G Bar G. Previous saddles I have rode on different horses are Martin Crown C, Bob Marshall Sports Saddle, Bob Marshall with forward hung stirrups, Corriente, Tammy Fischer by Circle Y, Just B Natural by Circle Y, Allen Ranch, Coats, Courts, Ammerman, Martha Josey Ultimate, Martha Josey Cash, Double J Lynn McKenzie (not recent ones - I hear they are better now), and Martin Saddlery barrel racer model. The saddle I purchased had a buffalo seat. It was not slick to ride and cost $3,400. A former Gist buckle employee now does his silver work and has some beautiful different options. I would have bought another saddle from them 5 years ago....now no way. I dont know if they changed makers or what but the quality and fit has gone down hill. 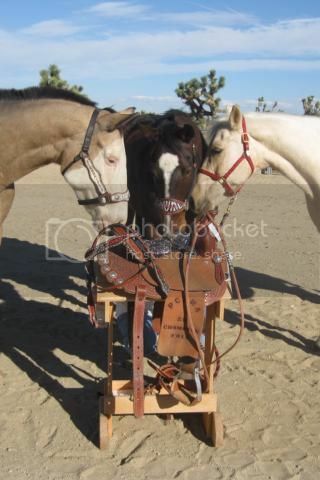 Now I am stuck with a saddle that doesn't fit my horse and no one to buy it.